Rich and Ronnie Veillette spent the last three and a half years of their careers as expat's in West Africa. Rich's colleagues asked him what he was going to do when he retired. His standard reply was, “I’m going home to my His family and live the dream”. 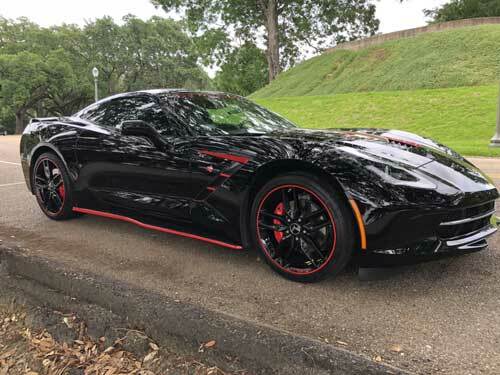 A week after returning home to the good old USA, The Veillette's purchased a beautiful double black 2015 C7 Stingray Coupe with the ZF1 package. The dream began. Rich became the second proud owner of a six month old C7 with only 2,000 miles on the odo. This decision was not a spur of the moment buy, Rich spent months searching the internet for the perfect Corvette. When him and his wife saw this beauty they knew it was the one. After the purchase Rich and his lovely wife Ronnie immediately joined the Baton Rouge Corvette Club . After riding with the club and attending car shows he decided to add a few custom mods to the car. The first thing he did was to have the car ceramic coated. This was a really great decision, since the Vette always looks great and is really easy to keep in showroom condition. Rich decided to add a custom air brushed hood liner to the car. He had seen a lot of hood liner art but wanted something that would set his car apart and deliver a message. Rich is a Marine Vietnam Veteran who always appreciated the charmed life he had. He is grateful that he had a chance to do things in his life that many others never had a chance to start. 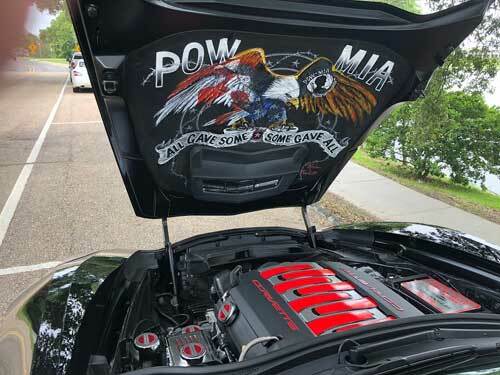 Rich dedicated the car theme to honor Vietnam and all other Veterans . He really wanted the cars art work to reflect his and our county's appreciation to all that have so bravely served. The art work is Rich's way of keeping the memory alive of all the sacrifices they made so the rest of us can enjoy our freedoms. After the custom hood liner was complete Rich added LED lights to light the painting and side vents. The black paint was accentuated with a variety of torch red and carbon fiber wrap. The engine bay, side vents, back vents, rims, side skirts, trunk interior and Stingray image on hood is tricked out in black carbon fiber. Now that the car is dressed up, Rich and his wife love to go on cruises and car shows. Their black beauty has done well in shows by winning several trophies, veteran award, and sponsor awards. 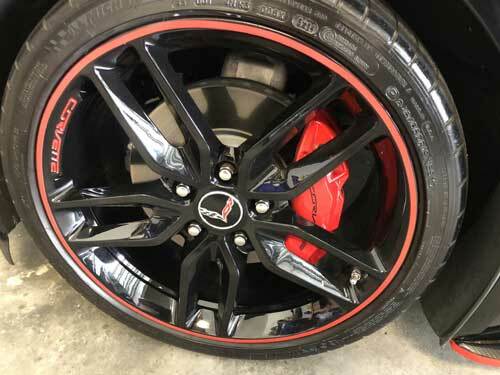 Rich tells us that its always a fun time when you meet with other Corvette owners and it’s great to see how others take care and modify their rides. Being a member of the Baton Rouge Corvette Club,Rich participates in an annual open car show that supports St Jude Children’s Hospital. His last show raised approximately $73,000. Many people ask Rich if this is his first Vette. Once you get the Corvette fever, you never lose it. This is Rich's 4th Vette. His previous toys included a 65 327/300HP convertible.that he purchased when he returned from the service with the Marines back in 1967. His second Corvette was a 68 427/390HP . 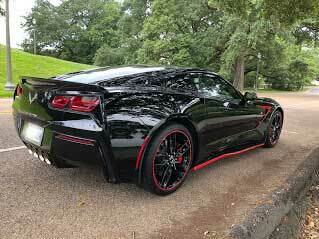 The third Corvette was a 71 350/270HP 4 speed that was actually his wife’s. In 1977 Rich and his wife had to give up the Corvette’s and get a station wagon to accommodate a growing family. From that day forward he promised himself that once the family was grown, they were going to own another Vette. After forty years the dream came true.